Click on Add to Cart buttons below to proceed with the purchase. We accept all major forms of payment. You will be redirected to PayPal secure web site to complete the transaction. Please review shipping and handling comments. 1. UPT_KIT1B is a general purpose photographic timer. It can activate camera shutter or flash in response to a trigger with a set delay. The timer emulates Canon RC-1and Nikon ML-L3 infrared remotes, therefore you can operate many cameras directly from the timer. 2. 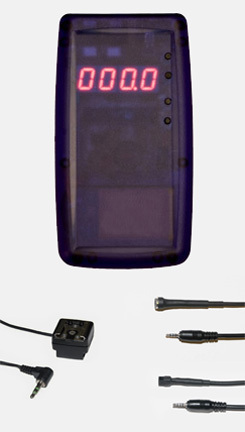 UPT_MIC1 is a standard sensitivity microphone that plugs into the timer. Trigger the timer with loud sounds. The microphone would be used for capturing popping balloons, impacts or used with ballistics. 3. UPT_OS1 is a simple photo-interrupter designed to detect existence/absence of an object. The sensor requires an off the shelf RED laser pointer (not included). To operate it, point the laser light at the side of the sensor (there is a small opening on the side). The timer triggers whenever the beam is interrupted. The sensor is can be used with large and small objects. The sensor can be used to activate your flash or your camera. 4. UPT_HS1. Most of the high speed photography involves the use of a flash. The hot shoe adapter is used to interface your flash to the timer. The above list is the most cost effective set that should allow you handle many photography projects. If you want to purchase different components or accessories, just visit our other pages showing individual components. Save $10 when buying the starter kit. Would you like to save additional $30 off the purchase price of the starter kit? If you own a web site, operate a blog or participate in forums and would like to review our product (a review including a link to Universal Timer web site, few sentences and pictures describing your photographic project), we can offer you a reviewer discount. Please contact us for more details. Prices in US Dollars. Currency conversion done by PayPal. By purchasing the product, you are indicating acceptance of Terms and Conditions, Refund and Warranty that govern the sale of the product from Universal Timer Ltd.